As women, we already know that we hold the power of the purse by influencing at least 85% of what’s bought or purchased in the United States. Our purchase power has the potential to severely impact the conditions of our planet yet still, according to the Clean Air Council Americans throw away 2.5 million plastic bottles every hour. That’s one big carbon footprint when you think about the energy that is created to produce, deliver and dispose of all those bottles. As we flex our consumer muscles and persuade companies to create more eco-friendly products, what do we do in the mean time with all that plastic? I’m inspired by several “extraordinary Jane’s” who are creating solutions to this enormous plastic problem. 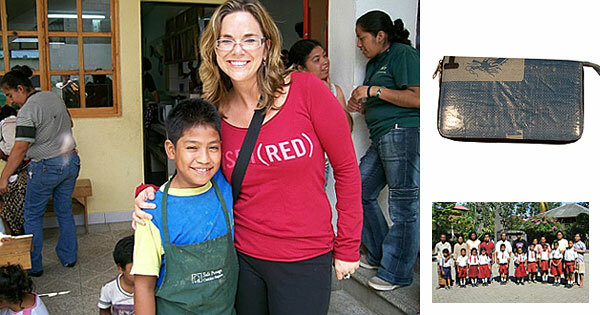 Five Accessories co-founder Christine Hutchison developed a way to enhance the planet and support women and communities around the world. While traveling in Bali with her husband they met a Balinese tour guide who told them that a gift of $5 per month from an American couple had enabled him to stay in school and eventually send his children to college. In admiring the beautiful natural craft work, the couple envisioned the potential of promoting the local artwork with the western world and supporting local fair trade artisans in countries such as Cambodia, Honduras and Bali who are using sustainable materials. They support women who are turning their trashy plastic into plastic purses. Following, they established Five Accessories whose mission is to “create income generating programs for individuals in need, donate a large portion of it’s sales to worthy charitable causes and foster the use of sustainable material in fashion.” As a result, the company donates $5 of every handbag sold and 15 percent of all other sales to each artisan’s local cause. In searching for plastic alternatives while participating in the plastic challenge during our recent See Jane Do program, I was skeptical when a Five Accessories representative asked if I would review their socially conscious plastic handbags. After all, I am trying to eliminate my use of plastic, not buy more. However, I was surprised to discover that the handbag I received was made from plastic trash. 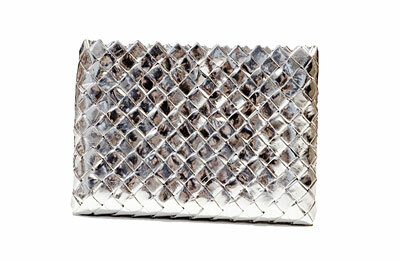 Every woman needs at least one small handbag to tote to events and evening outings. So, how about one made out of post-consumer potato chip bags. Five Accessories has partnered with Manos de Madres and the women of COFEACOMA, a cooperative of certified organic coffee growers in Honduras who handmade these stylish handbags from snack chip bags. I would never suspect this purse is made from trash. It’s just good clean fun. The only part not made of recycled plastic bags is the zipper hidden on the inside. This finely crafted, light-weight handbag is perfect for a trip to a show rather than a trip to the dump. Another plus is that this fair trade project provides income for women artists and their families, supports education and community health, and contributes to women’s empowerment and entrepreneurship. In addition to teaching the community the benefits of recycling they are burning less trash. Five Accessories’ artisans aren’t the only ones inspiring action from art. Recently, I interviewed eco-artist, activist, and surfer, Kathleen Egan. Kathleen became deeply concerned when her backyard, Ocean Beach on the Pacific Ocean, became increasingly littered with the same kind of plastic debris that was described at the Pacific “plastic” Gyre. 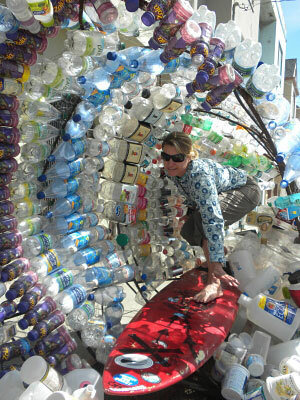 Determined to make a positive difference and demonstrate the negative impacts of consumer choices, Kathleen accumulated plastic from her friends and within three weeks had enough bottles to create a gigantic plastic wave. She’s featured the wave in several events and art showings, enabling participants to ride inside a wave of plastic. Most riders, she says, are generally humbled by the experience when they come face to face with how much plastic we really throw away. Kathleen oversees the plastic committee in San Francisco with Surfrider and encourages everyone to join the campaign that demands Jamba Juice replace their styrafoam containers with a more eco-friendly version. Better yet, we can bring our own cups! Christine Hutchison and Kathleen Egan demonstrate that there are possibilities in everything and what we choose to buy or not buy carries a lot of weight for the planet and our quality of life. How are you using the power of the purse to enhance the planet? Share with us at SeeJaneDo@kvmr.org. Next Are We Eating Fake Plastic Fish?